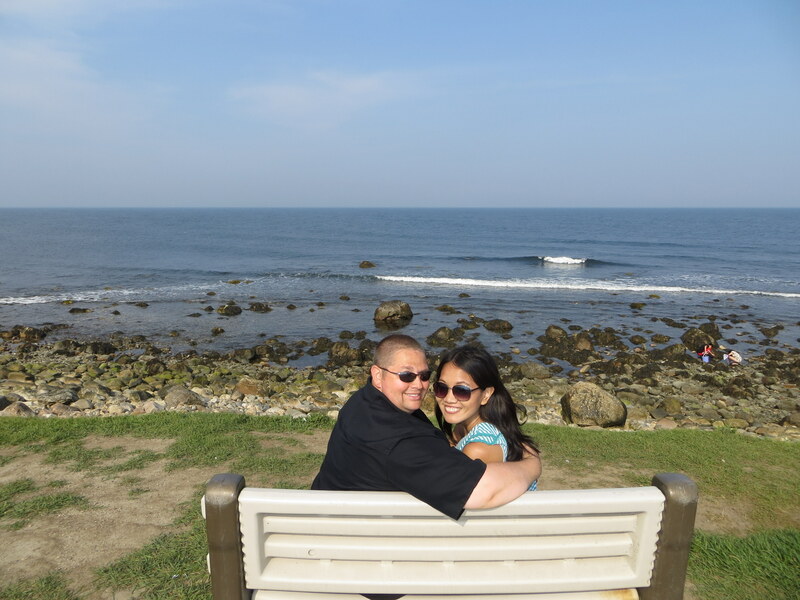 Our summer trip to New England came as a little bit of a surprise, as we had originally planned on a road trip to Ohio. But Johnny had some Marriott Rewards points to burn, and we ended up using them for a week-long stay at the Renaissance Providence Downtown Hotel, Rhode Island. 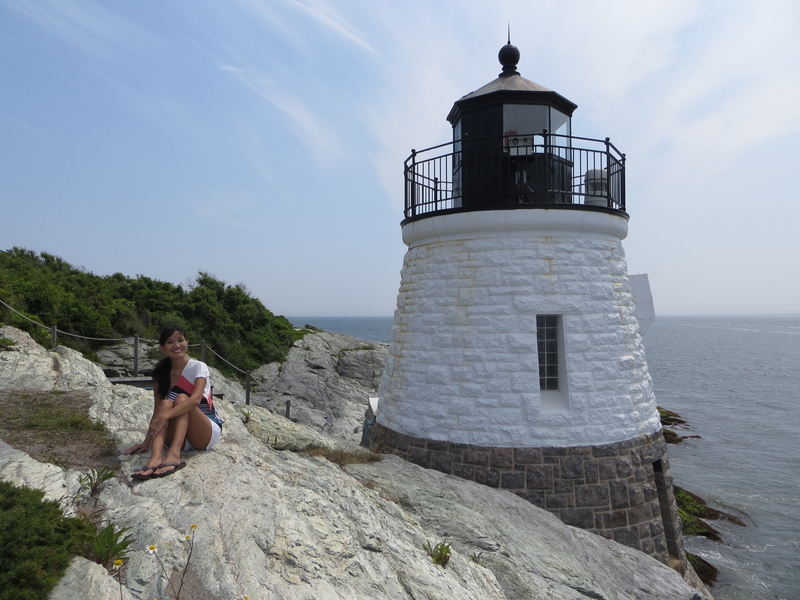 Below are highlights of our adventures in Massachusetts, Rhode Island, and Connecticut. A trip to New England is not complete without experiencing Boston, one of the most historic cities in the US. I also wanted to catch up with my old college friend Emily, whom I had not seen for five years. Since we were in Boston for only a few hours, sightseeing was mostly limited to the Boston Harbor area. 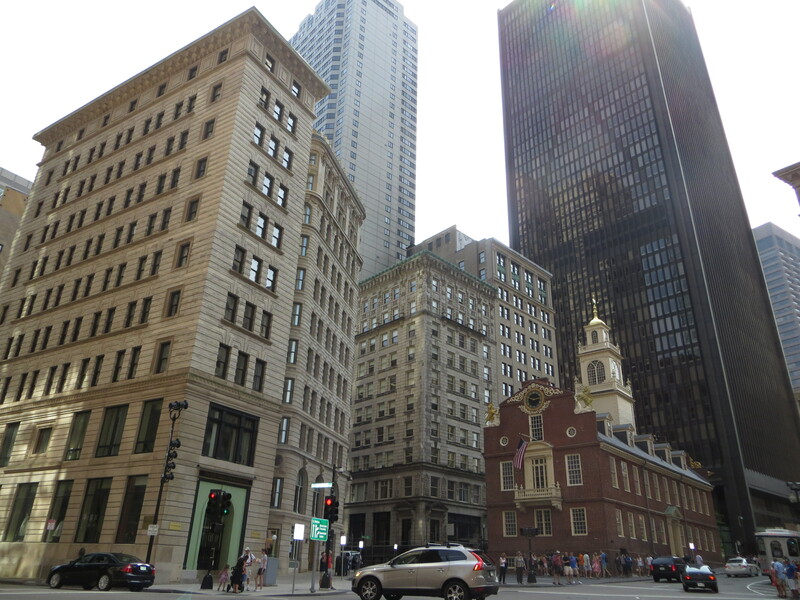 We saw Quincy Market, bought some souvenirs at Faneuil Hall, and took lots of pictures in front of the Old State House. For what it’s worth, at least I can now say that I’ve walked a tiny portion of the Freedom Trail. 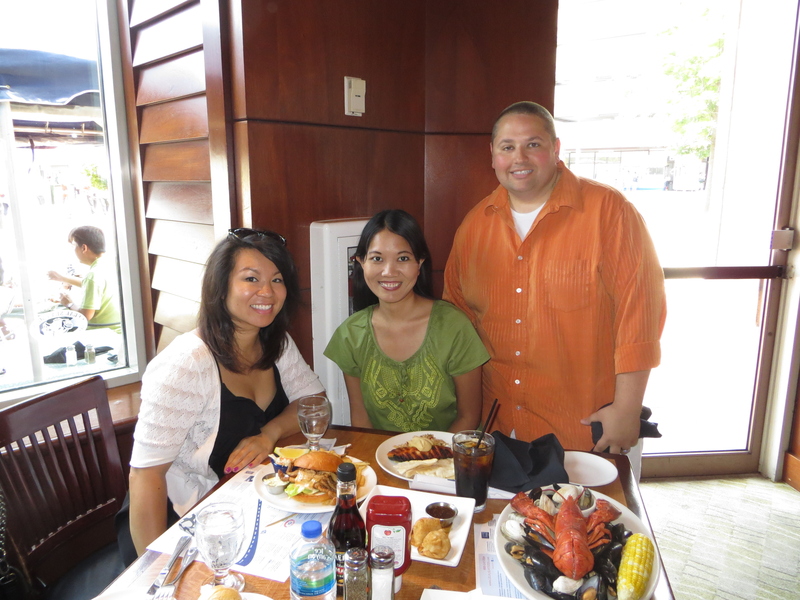 Dining: At first I chose for us to have lunch at Legal Sea Foods – Long Wharf because of its proximity to the harbor. Fortunately, the food turned out to be great, and we happily feasted on seafood (this describes our daily routine on this trip). Johnny did not think twice about ordering the lobster boil, while Emily and I tried their shrimp wontons, grilled salmon, and soft shell crab sandwich. Providence makes a great home base to see the entire state of Rhode Island, and to visit its neighbors Massachusetts and Connecticut. 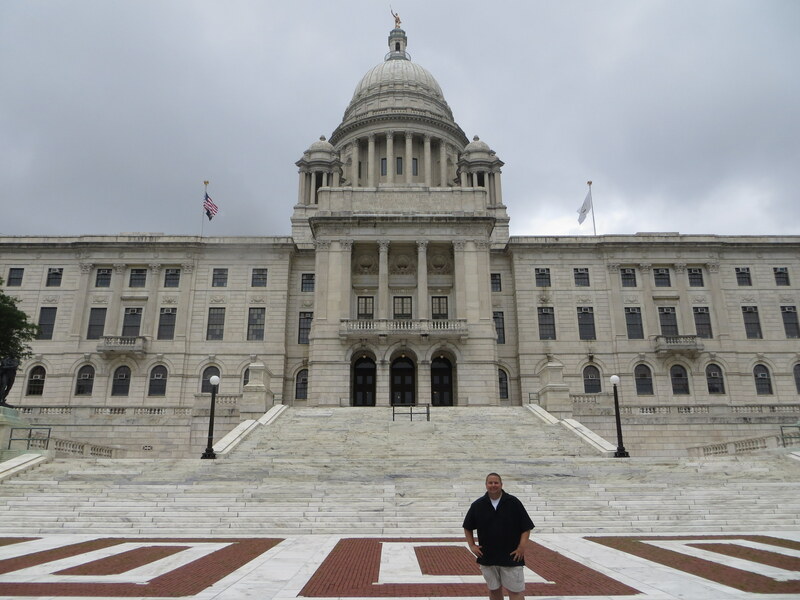 The Rhode Island State House was located across from our hotel, which made it the perfect opportunity for us to learn a little bit about the Ocean State’s history. 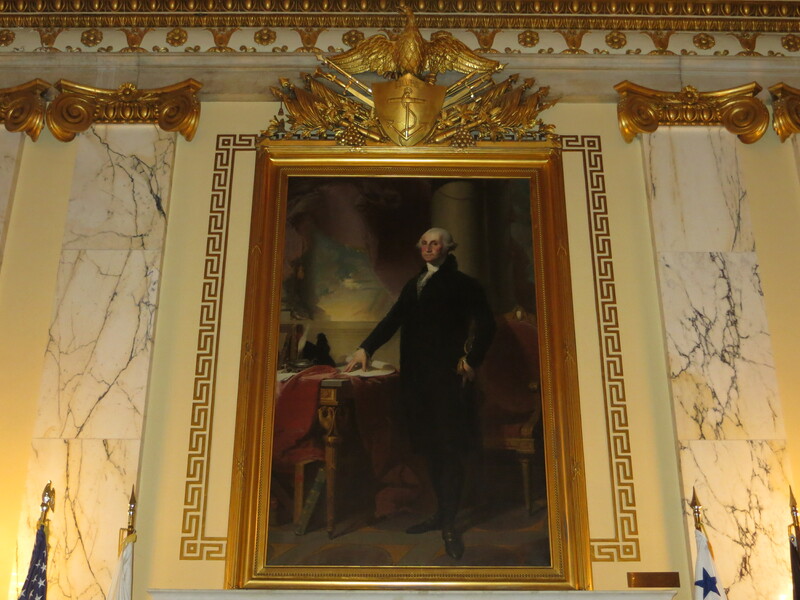 Inside we found an original portrait of George Washington by Rhode Island native Gilbert Stuart. There was also a canon from Gettysburg, and flags dating back to the Civil War era. The architecture of the building itself is quite impressive, as it boasts the fourth-largest self-supporting marble dome in the world. Admission: We went on a self-guided tour. However, free 50-minute guided tours are offered Monday through Friday (click here for more information). 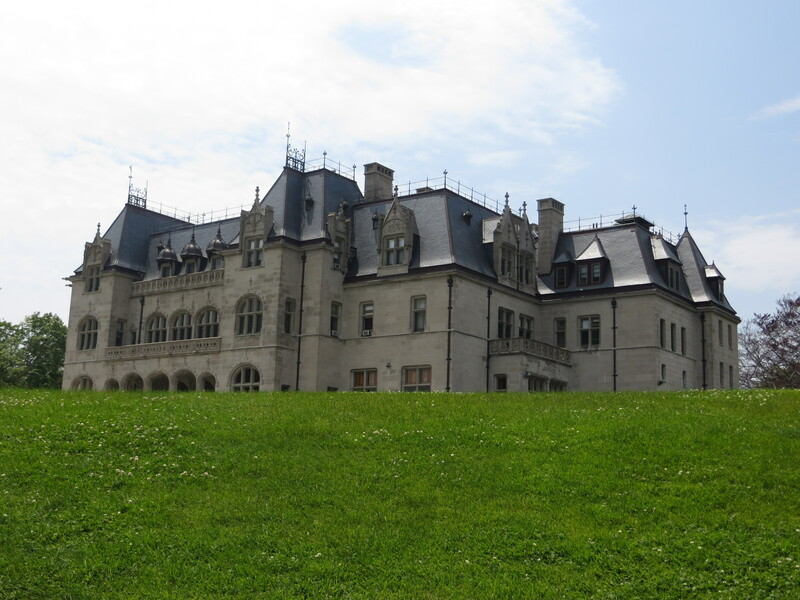 The Roger Williams Park is quite a gem as it contains seven lakes, lovely gardens, a Carousel Village, and is home to the Roger Williams Park Zoo and the Museum of Natural History and Planetarium. 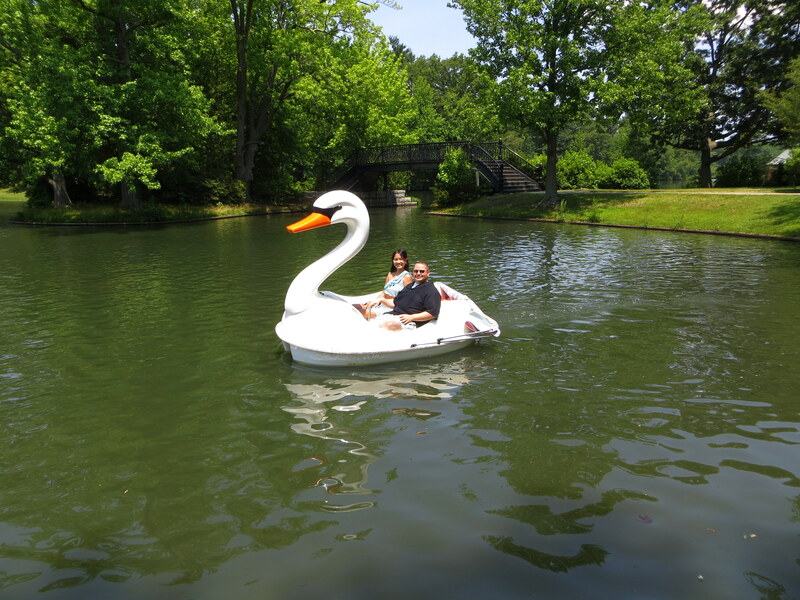 We ventured out to this park because Johnny was excited to ride a swan boat. We thoroughly enjoyed our time on the lake while taking in the view of its bridges. Admission: $7.50 per adult, $5 per child for a 20-minute boat ride. The boathouse is located near the Carousel Village. Dining: After we arrived at T.F. Green Airport, we drove to East Greenwich, which is just a few miles south of Providence, to eat at Blu on the Water. It was warm and sunny out, so we sat on the deck overlooking the marina while chowing down on a lobster roll and fish and chips. I had planned on dining at one of Federal Hill’s top-rated restaurants. However, we ran out of time and never made it to this district. Most evenings we enjoyed snacks and hors d’oeuvres which were provided by our hotel’s club lounge. When we were too tired to go out for dinner, we simply ordered from the hotel’s Public Kitchen & Bar. On our last day in Providence, we had fun building our own meals and watched the chef cook them in front of us at downtown’s Fire & Ice. Jamestown is situated on Narragansett Bay’s Conanicut Island. I love this town as it is quaint and has some of the most picturesque scenery in the state of Rhode Island. 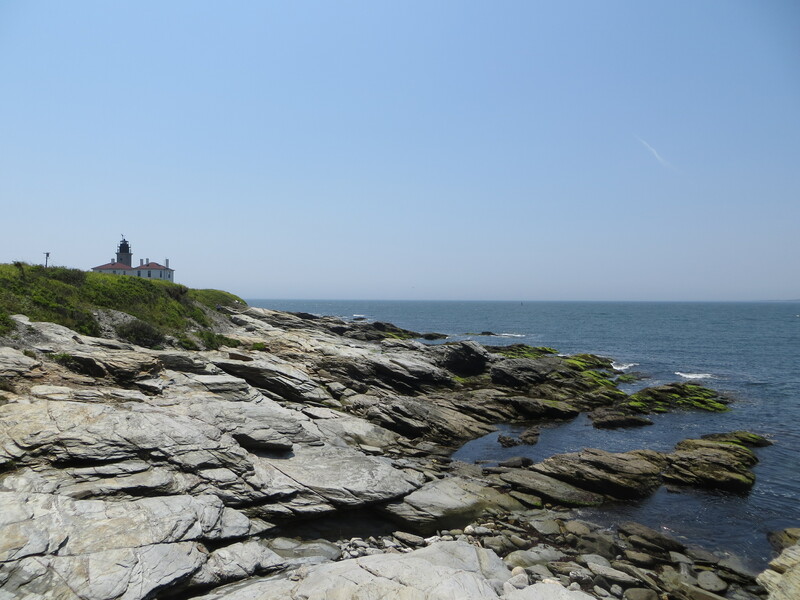 At Beavertail State Park, you will find dramatic, rocky cliffs that are synonymous with New England. It is home to the Beavertail Lighthouse, which is the third oldest in the US. Right next to the lighthouse, there is a very, very small aquarium that we did not bother to go into. Admission: No fee to enter the state park. The Lighthouse Museum is open from 10 AM to 4 PM, 7 days a week until Labor Day. Dining: Jamestown was the place where we were first introduced to Del’s frozen lemonade. Del’s is deliciously slushy and has a uniquely fresh lemon taste. For the remainder of our trip, we made every effort to look for a Del’s stand or truck whenever we needed to cool off. Narragansett is known for its sandy beaches. 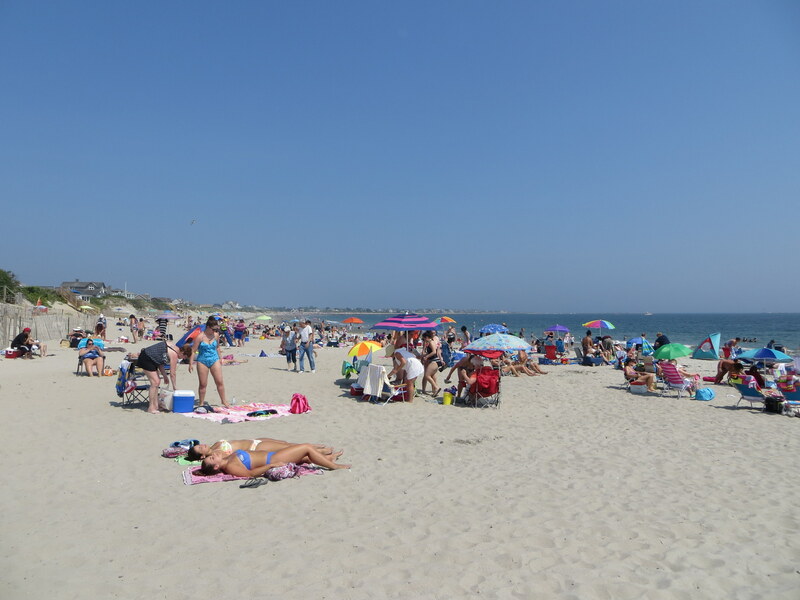 You can choose to relax at the Narragansett Town Beach or any of the three state beaches: Scarborough, Roger Wheeler, and Salty Brine. Port of Galilee is an authentic, working fishing village with a number of restaurants and shops. A lot of people come to this port to catch a ferry to Block Island. From Port of Galilee, we decided to walk a short distance to Salty Brine State Beach. It was crowded, but we still managed to have a good time people-watching and getting some sun. Parking: We found public parking behind The Lighthouse Inn of Galilee, which cost us $15. 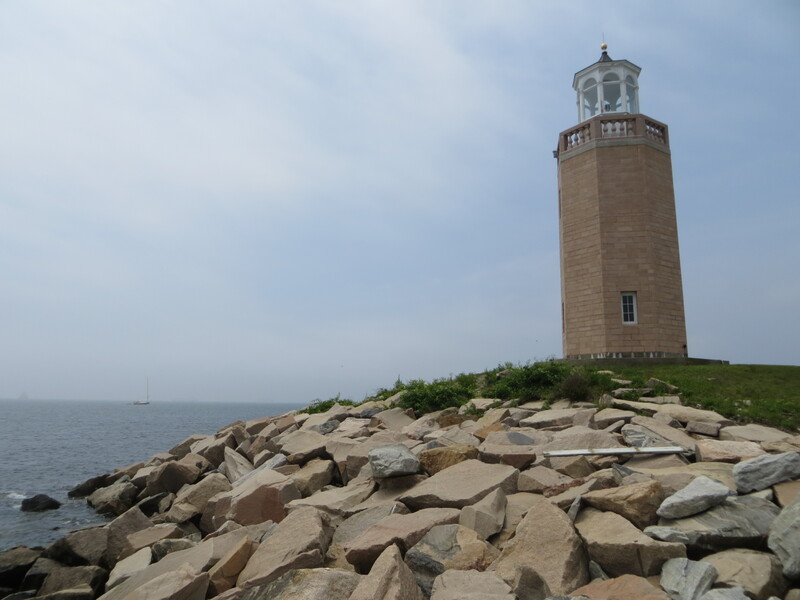 Our last stop in Narragansett was Point Judith Lighthouse, which is currently a property of the US Coast Guard. 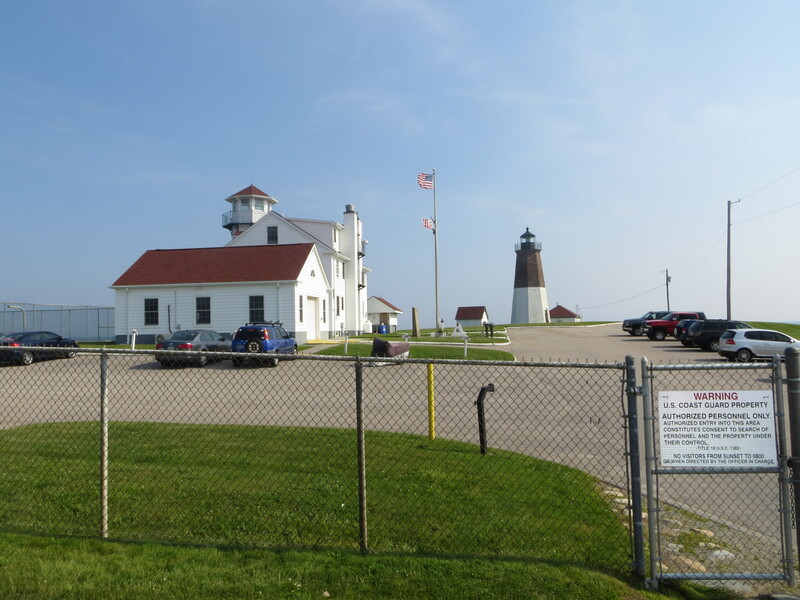 The lighthouse is not open to the public, and at the time of our visit people were not allowed to enter the grounds due to construction and damage from winter storms. However, the view that surrounds the lighthouse is quite beautiful, and we spent some time sitting on one of the benches watching the waves crashing on the rocky beach. 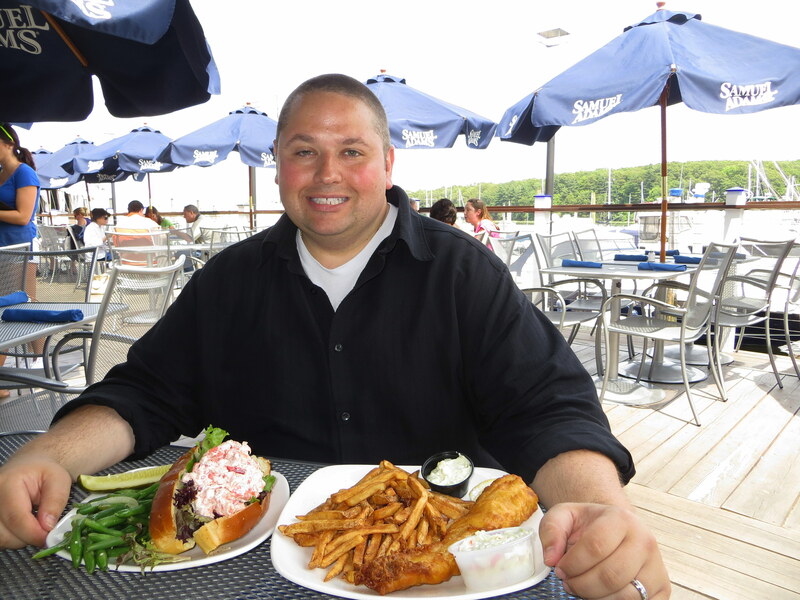 Dining: We shared “The World’s Most Expensive Lobster Roll” from Buster Krab’s in Port of Galilee. I also ordered their scrumptious “Coco-Nutty Shrimp,” which was served with “Ha-Ro” Asian Dipping Sauce. With nicknames such as America’s First Resort and Sailing Capital of the World, Newport is a must-see destination in Rhode Island. Ocean Drive winds through the homes of the wealthy along Atlantic Ocean’s scenic coastline. Being a lighthouse lover, I convinced Johnny to stop by Castle Hill Inn so that I could take a look at the Castle Hill Lighthouse. It was a nice spot to enjoy the cool ocean breeze and watch the ferries go by. Afterwards, we took our beach chairs out of the car, and rested at one of the coves along Ocean Drive. 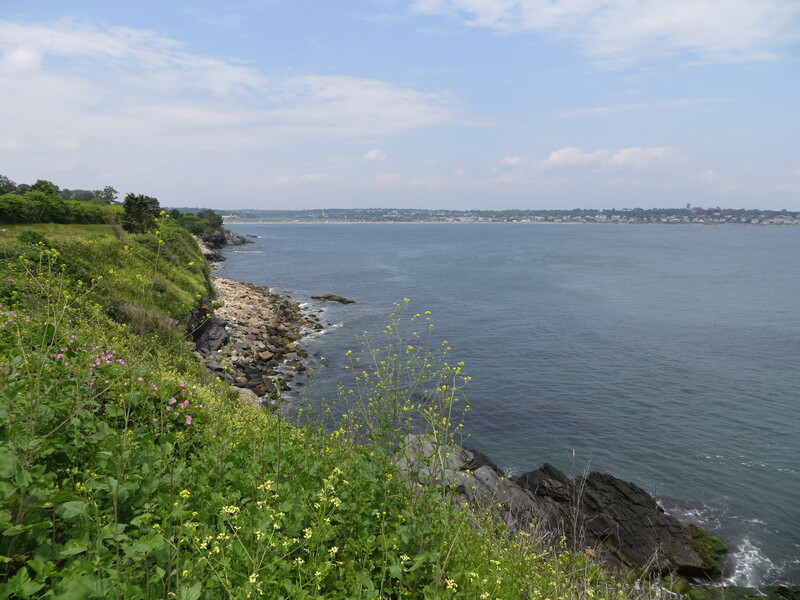 When we came back for our second afternoon in Newport, we walked along the famed Cliff Walk, which combines the rugged beauty of Rhode Island’s shoreline and the refined architecture of some of Newport’s Gilded Age Mansions. Unfortunately, a section of the Cliff Walk was closed due to damage from Hurricane Sandy. On our way back to the hotel, we made a quick stop at Prescott Farm in Middletown, just north of Newport. 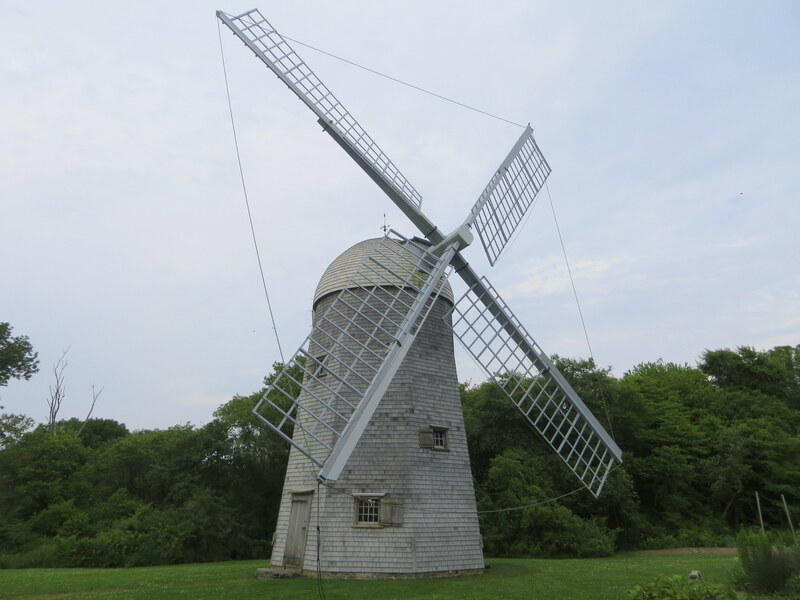 Herb gardens, historic buildings dating from the 18th century, and a windmill built in 1812 can all be found on this piece of land. Dining: My friend Emily had recommended a place called the Barking Crab while we were in Boston. Later in the week, we passed by this restaurant in Newport, and decided to eat there. Thanks to the Barking Crab, Johnny finally got to satisfy his craving for shrimp boil. 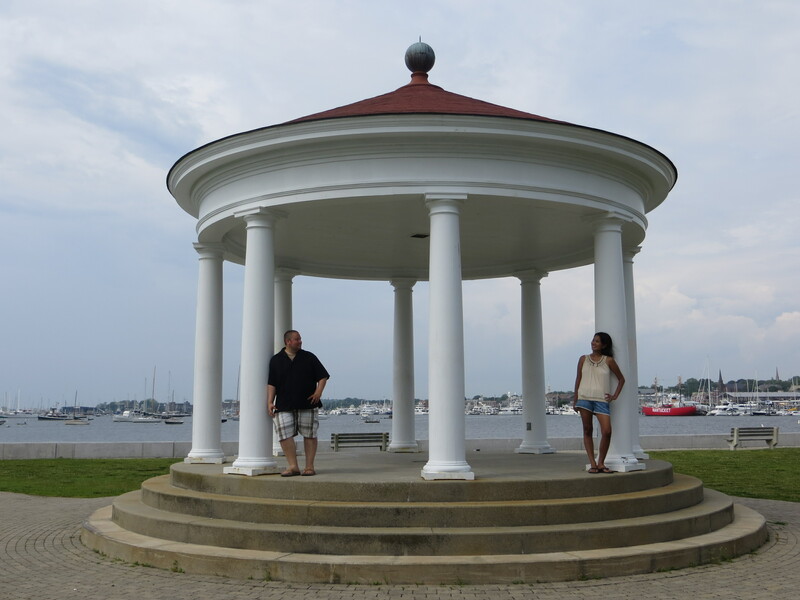 To round up our New England trip, we spent one day exploring the Connecticut coastal towns of Groton and Mystic. The Avery Point Lighthouse is located on the campus of the University of Connecticut Avery Point in Groton. It was the last lighthouse to be built in Connecticut. Although the lighthouse is not open to the public, we found the campus to be absolutely beautiful. From here you can view the New London Ledge Lighthouse on Thames River from a distance. 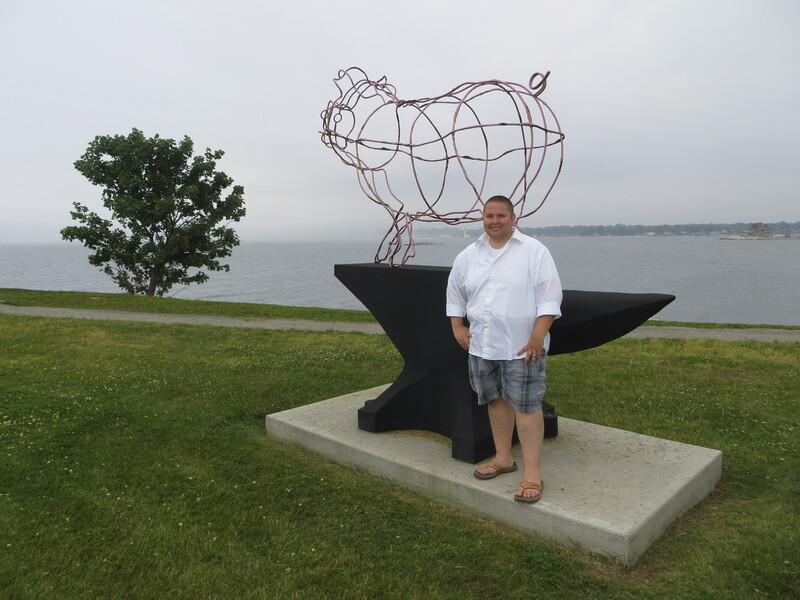 Additionally, the path from the parking lot to Avery Point Light is dotted with interesting sculptures. From Groton, we headed to nearby Mystic, a historic village known for its seaport. At the time of our visit, the Mystic Seaport, which is considered the nation’s leading maritime museum, was restoring the Charles Morgan, the last wooden whaleship in the world. 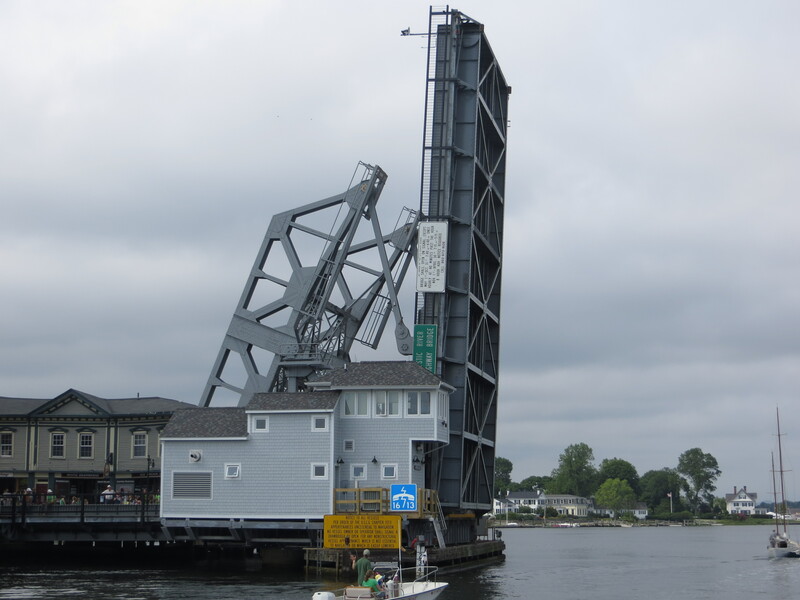 If you have a few minutes to spare, it’s also interesting to watch the Mystic River Bascule Bridge raise to let taller boats through. Dining: We had a late lunch at Mystic’s Ancient Mariner restaurant, where we enjoyed their “Lazyman Lobster” (a fully shelled lobster baked with breadcrumbs on top) and the BLT Burger. Johnny also picked up a cup of ice cream from the Mystic Drawbridge Ice Cream shop. This concludes our week in New England. All in all, it was a great week full of fun and sun, which allowed us to head home feeling healthy and rejuvenated. You can visit our Flickr page to view more pictures from our trip. Thank you, Peggy! I look forward to seeing you both. Have a happy new year! Found your review through one of your posts on Tripadvisor. Since I am planning a trip to Newport/Boston/Providence, I really enjoyed your trip report. Thanks for pointing out admission fees and all the yummy places you ate at! Have a wonderful time exploring New England!